It would be fun to write a page on balloon decorating ideas I thought. The only hitch being, that I don't know anything about balloon decorating! Luckily, during my research, I came across Margit who runs the Balloon Decoration Guide and asked her if she'd kindly do an interview for www.great-happy-birthday-ideas.com. Hi Margit, thank you for agreeing to answer some questions about balloon decorating ideas. 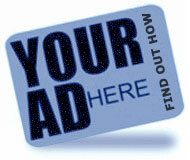 Before we start can you tell us about you and your website? My site was actually born out of a failure... the failure to get our balloon decorating business off the ground in Germany. As explained on the about me page, my then partner John and I had the idea to run a balloon decorating service in the little town in the south-west of Germany where we lived. John had brought this hobby over with him from Scotland, where balloon decorations are a big hit. Unfortunately, most Germans consider balloons as children's toys and nothing else. Despite all our marketing efforts - we even had an official launch date with the mayor of our town - we only got a couple of decorating jobs. So we decided to use our knowledge and passion for balloon decorating to create a web site instead. The great thing with the web is that you can reach people worldwide, not just in your home town. I get asked often for romantic birthday ideas. Have you got any balloon decorating ideas for a romantic birthday theme? Balloons are ideal for romantic (surprise) gifts. Balloon bouquets in pastel tones with a matching flower base and tulle decor come to mind. Or, if the birthday person lives further away, you could surprise him or her with a "Balloon-in-a-Box". Balloon decorating is really not as difficult as it might look, Sophie. You just need the right materials, clear instructions and a bit of patience! I would suggest to start with a balloon bouquet, also often called a balloon centerpiece. 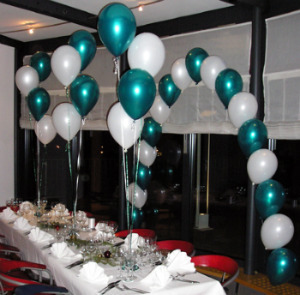 With just three balloons, helium, curling ribbon and either a self-made or commercially available balloon base, you can achieve a stunning effect. 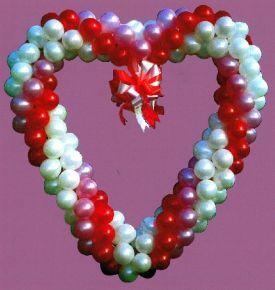 Have a look at our “Balloon Bouquet Simple & Elegant" for step-by-step instructions. I guess you have a nifty gadget for blowing up balloons! But do you have any tips for making the process a little less effort for those of us without a gadget? First of all, start with round 9" or 11" latex balloons. Some people say that jewel-toned balloons are the easiest to blow up, because the latex feels a bit thinner, which makes it easier to inflate. Step 1: Stretch the balloon a bit with your hands before beginning to blow. This warms up the latex and makes it easier to fill with air. Put the entire opening of the balloon between your lips and hold it near your lips with one hand and hold the bottom of the balloon straight out with the other. This stretches the balloon neck so the air can flow evenly into the hole. Step 2: Next, begin to blow. There will be a bit of resistance before the inflation begins. Do not blow with all your might because it may give you a headache, especially if you start blowing hard before the inflation starts. The trick is to start the flow of air and then keep blowing. Once the inflation begins, you will need to pause every few breathes to inhale. When you do this, clip off the neck or opening of the balloon with your fingers on the hand near your mouth. This prevents the air from flowing back out. Inflate the balloon until it feels taught, but make sure the neck is still pliable. This will keep the balloon from exploding and it will enable you to tie off the end. Step 3: Now that the balloon is inflated, tie a knot in the tail. You have done it! The balloon is inflated. You'll find those tips on our web site as well, plus a video that shows how to best tie a balloon knot. 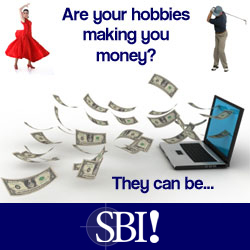 Do you have a funny story from the perspective of a professional balloon decorator? Don't be stuck for balloon decorating ideas. 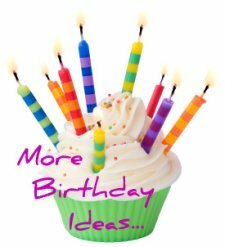 Sign up to my newsletter Full of birthday tips and ideas and receive 101 birthday ideas absolutely free!